The Walk of Fame is a quarter-mile walking path in Heekin Park which highlights people and organizations in Delaware County’s history who made a difference by breaking down barriers. They are the first black teachers, firefighters, police officers, politicians, and more. The Walk of Fame is a project of the MLKDT, The City of Muncie, and Muncie Public Library. The project was unveiled in 2011, with additional plaques being added as budget and weather permits. The walk is open each day during park hours. The welcome plaque is located directly across from the Vietnam War Memorial in Heekin Park. 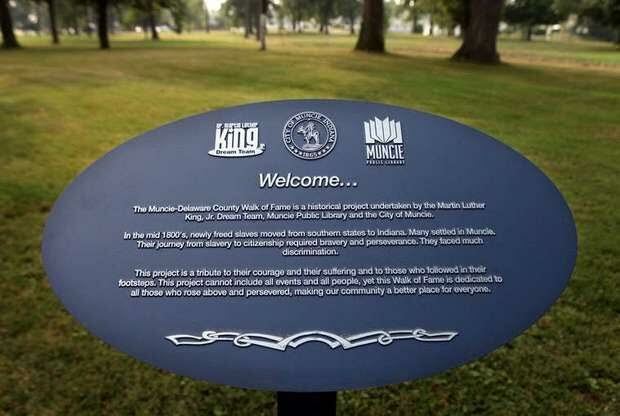 The MLKDT thanks the City of Muncie and the Parks Department for maintaining this historical project.